Our Work / Celtic Link Ferries. Celtic Link Ferries is an Irish-owned low fares ferry company offering passenger and freight services to Rosslare and Cherbourg. They approached us to promote their business, with particular interest in raising the profile of their passenger service. 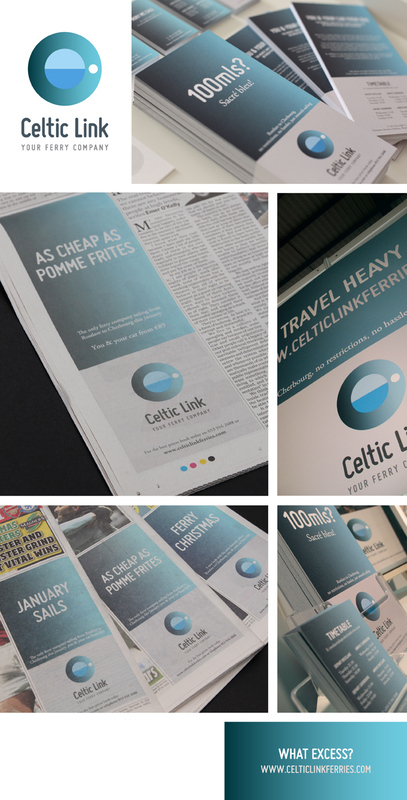 After analysis, it became apparent that a complete design and strategic overhaul was needed for Celtic Link to prosper as a challenger brand. We distilled the ethos of the company to three attributes which we wished to communicate: Simplicity, Confidence & Tranquility of the voyage. From this foundation we set about the rebrand. To differentiate the Celtic Link from their competitors, we chose the porthole, the passenger’s point of view, as the focal point of the new identity. This design is confident and modern, expressed in fresh blue and bright cyan colouring, unique in the sector. The new tagline ‘Your Ferry Company’ communicates confidence and promotes loyalty in the target audience while the copy lends an irreverant, approachable tone-of-voice. The rebrand has been expanded across all printed media, exhibiton stands and advertisments, with a new website due later in the year.